This exhibit at the Northern Great Lakes Interpretive Center shows the extent of the Canadian Shield, an area underlain by impermeable bedrock covered by poorly drained, acidic soils of low fertility. Below the Arctic, the Shield is mainly forested and is thinly populated. Because of not only flat and boggy but also uneven and boggy terrain, road building through the area is particularly difficult. US 2 traverses the Canadian Shield in the Upper Peninsula of Michigan and in northern Wisconsin and Minnesota. The Canadian Shield is a large geographic area in eastern and central Canada, composed of bare rock dating to the Precambrian era (between 4.5 billion and 540 million years ago). It is also called the Precambrian Shield, or Laurentian Shield, or Laurentian Plateau. The shield is approximately U-shaped, with the points in the arctic. It covers much of Greenland; Labrador; all of Quebec north of the St. Lawrence River; much of Ontario outside the southern peninsula between the Great Lakes; upstate New York; parts of Michigan, Wisconsin, and Minnesota; the central portion of Manitoba away from Hudson's Bay and the Great Plains; northern Saskatchewan; a small portion of north-eastern Alberta; and the mainland northern Canadian territories to the east of a line extended north from the Saskatchewan/Alberta border (Northwest Territories and Nunavut). In total it covers approximately eight million square kilometers. Such a large area of exposed, old rock requires some explanation. The current layout of the Shield is one of very thin soil lying on top of the bedrock, with many bare outcrops. This arrangement was caused by glaciation during the last Ice Age, which covered the shield and scraped the rock clean in doing so. The multitude of rivers and lakes in the entire region is caused by the watersheds of the area being so young and in a state of sorting themselves out. The shield was originally an area of very large mountains and much volcanic activity, but over the millennia the area was eroded to its current much flatter appearance. Mountains have deep roots and float on the denser mantle much like an iceberg at sea. As mountains erode, their roots rise and are eroded in turn. The rocks that now form the surface of the shield were once far below the earth's surface. The high pressures and temperatures at those depths provided ideal conditions for mineralization. The shield is one of the world's richest areas in terms of mineral ores. It is filled with substantial deposits of nickel, gold, silver, and copper. Throughout the north of Canada there are many mining towns extracting these minerals. The largest, and best known, is Sudbury, Ontario. Sudbury is an exception to the normal process of forming minerals in the shield since the Sudbury Basin is believed to be an ancient meteorite impact crater. The shield, particularly the portion in the Northwest Territories, has recently been the site of several major diamond discoveries. The kimberlite pipes in which the diamonds are found are of relatively recent origin, and one theory of their origin suggests that the shield was at some time in the past above a hot spot in Earth's mantle (much like the one that formed Hawaii, but under land rather than ocean). The spot lifted the surrounding landscape as continental drift moved over it, forming the pipes in various locations. The line of [underwater] subsurface mountains that runs from the eastern seaboard of the United States nearly to Europe before culminating in the Challenger Seamount would, if run backwards in time, follow a path that matches what is suggested. 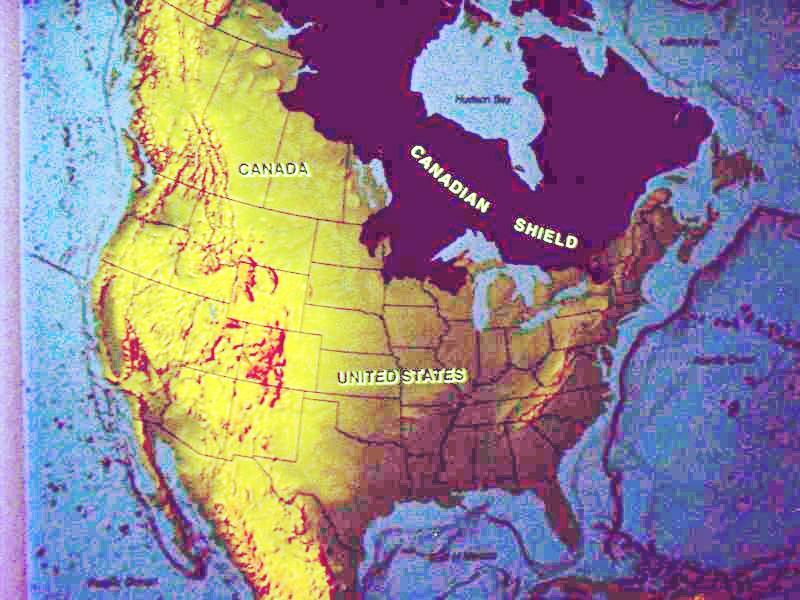 The shield is also covered by vast boreal forests that support an important logging industry. Woe betide the tardy traveler who wishes to take in the Visitor Center at the Ottawa National Forest or even to set up a tent at the Sylvania Campground. Visiting hours are over precisely at 05:00pm, and no dropbox is provided for camping fees; registrations are accepted only during business hours. After discovering this, I pressed on to Wakefield, MI, where local government underwrites a nice RV and tent campground next to Eddy Park on the north shore of Sunday Lake complete with flush toilets. Tent sites are five dollars, showers are 25¢, and a hostess is always on duty -- to answer questions. 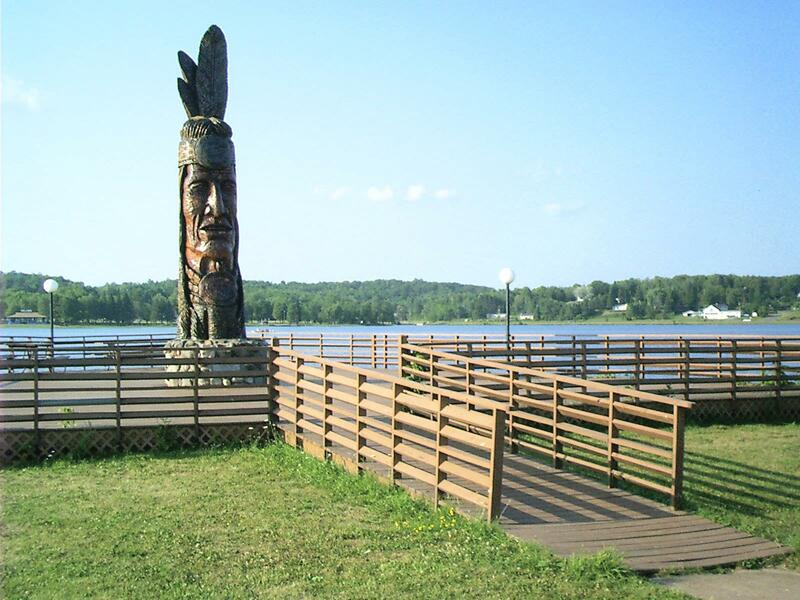 The statue on the south shore of Sunday Lake at Wakefield, MI, was carved out of a pine stump from the Ottawa National Forest by Hungarian sculptor and writer Peter "Wolf" Toth in 1988 to honor the Chippewa Indians. It is one in a series of five dozen scattered throughout North America called "The Trail of Whispering Giants." I am convinced, however, that "Leading Man" bears a striking resemblance to Peter O'Toole in his role as King Priam in the 2004 blockbuster movie Troy, and I am unanimous in this! 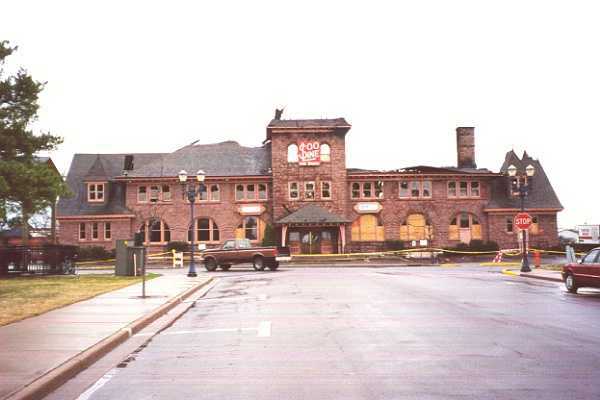 This classic brownstone depot housing food services and offices burned on 1 APR 2000. The building's exterior has been reconstructed, but it still stands unoccupied. 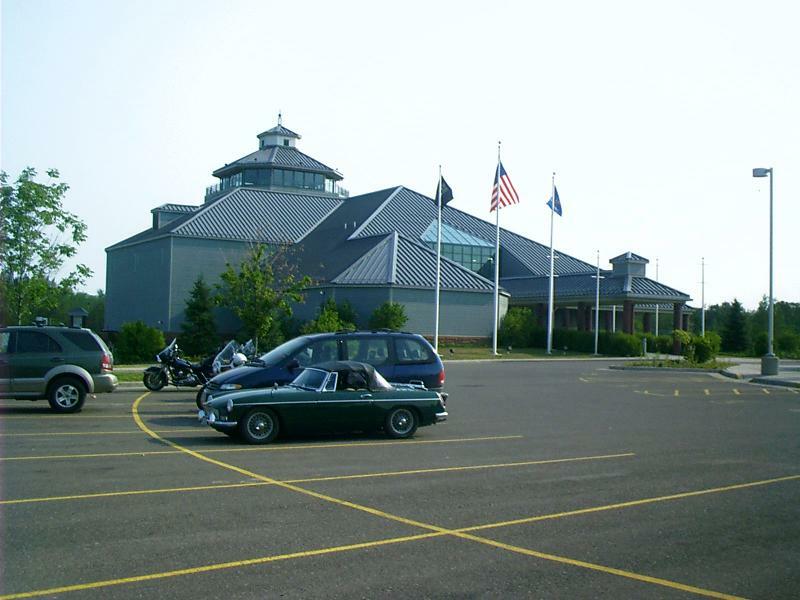 The Northern Great Lakes Regional Visitor Center is located 2 miles west of Ashland, Wisconsin on U.S. Highway 2. 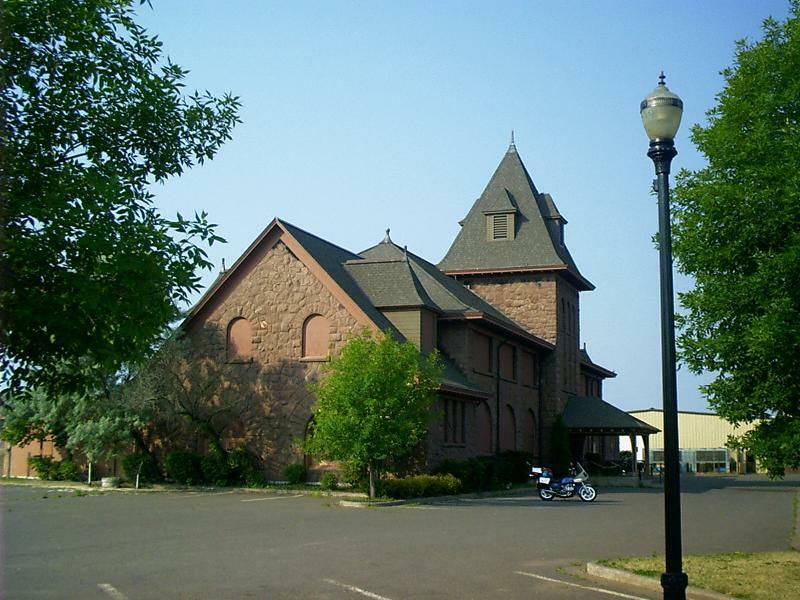 It features an observation tower, 100 seat theater, visitor information/trip planning area, interpretive exhibits, historical archives/research area, classroom/meeting rooms, outdoor amphitheater, interpretive trails and gift store. The five story observation tower overlooks Lake Superior and the Ashland skyline. The Center presents an overview of the historical interaction of human cultures and the land and natural resources of this region from the Ice Age to the Present. 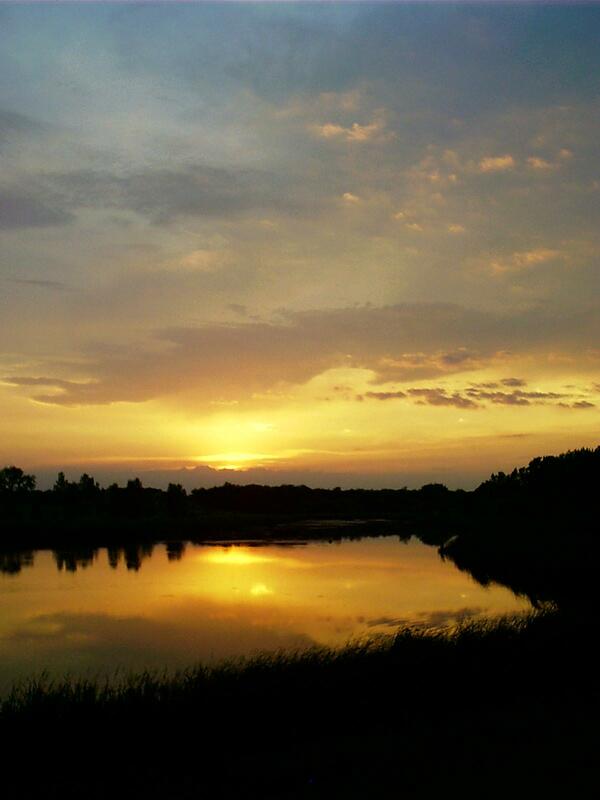 Our region includes the northern thirds of Wisconsin, Minnesota and Upper Peninsula of Michigan. It touches the shores of two Great Lakes, Michigan and Superior, and has a larger concentration of public lands than any other region east of the Mississippi. It is unified by a shared geology, ecology, history and a common heritage. One crosses the Bois Brule River at Brule, WI. 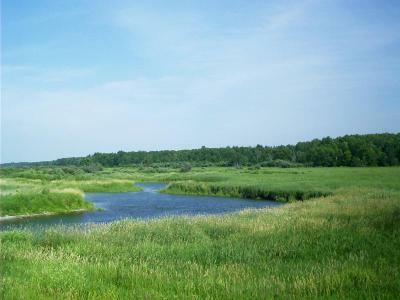 This blackwater stream drains conifer swamps, thus, as is typical of creeks on the Canadian Shield, its waters are dark brown with acid pH and low alkalinity. The French appellation, which means "Burnt Wood," seems apropos but, in fact, has connotations beyond those of the place. It is assumed that the word Metis was used for some time, before Louis Riel, to describe people of mixed Indian and White descent. The word itself comes from the French, meaning, simply, "mixed"; or, in Spanish, it was "Mestizo". However, the first use of the word in public print comes from the pen of Louis Riel himself, from an article that was published in the Globe and Mail not long after his death. People of mixed heritage had existed from at least the mid-sixteen hundreds or nine months from the time the first white man set foot in North America. The Algonquin tribes, especially Ojibway, called them "wissakodewinmi" meaning burnt-sticks and later Frenchified into "Bois Brule" by the French colonists. The English called the Metis "half-breed," but this was generally a misnomer as there were few Metis who were actually of pure White and pure Indian ancestry in half and half portions. In some early official accounts and reports, the Metis were referred to as "natives" to distinguish them from Indians. The racial awareness of the Metis themselves is more significant than the French or English characteristics of their European forefathers. The definition is not restricted to the physical area of Red River, either, but is developed as a living process in today's society. Wilkins, Mike, Ken Smith, and Doug Kirby. The New Roadside America: The Modern Traveler's Guide to the Wild and Wonderful World of America's Tourist Attractions. This is the parent publication of http://www.roadsideamerica.com/ and ought not to be confused with coffee-table books with similar titles and a hot-rod motif by Lucinda Lewis. Thompson, Hunter S. Hell's Angels. No bookstores nor libraries seem to stock this seminal work by the original gonzo journalist. ... can't think why. Lo and behold, wireless worked there, too. The sun was well up before I packed my toys and headed down the road. The land was level, marshy, and featureless. Once upon a time, there was an explorers' crusade to find the true headwaters of the Mississippi River. Discoveries were controversial. You can't tell which tributary contributes the greater volume when you can't tell which end is upstream. Creeks don't appear to flow in any particular direction in that country. You wind up trying delicately to measure altitudes of potential sources to determine which is vertically the more remote. ... you have to believe this creek is of larger significance than the wide Missouri and rightfully lends its name instead to the mightiest watershed, which draws all streams toward the Gulf of Mexico from the continent's interior. 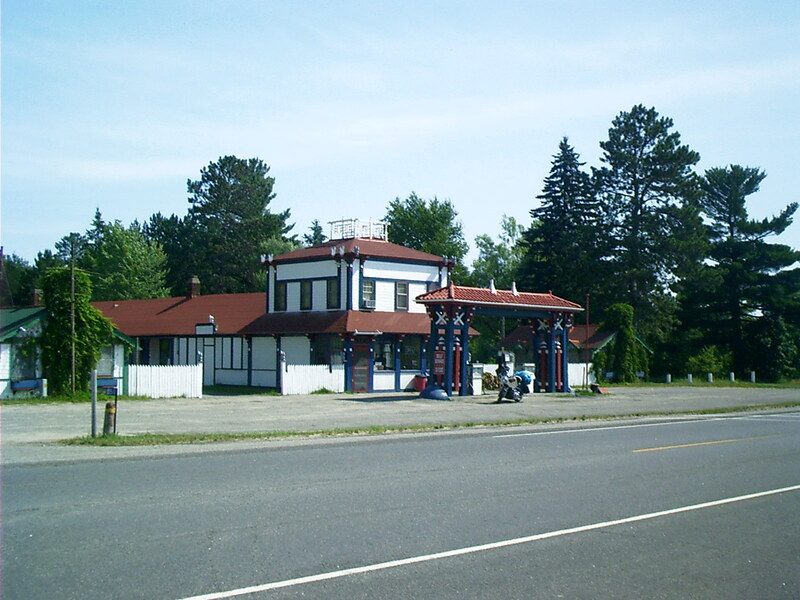 This general store is the gateway to Lake Winnibigoshish and the resort community of Bena, MN. I regret the bogus attribution to architect Frank Lloyd Wright that appeared here until April 2012, which laughably arose from my (and others') confusing it with the R.W. Lindholm Service Station in Cloquet, MN. 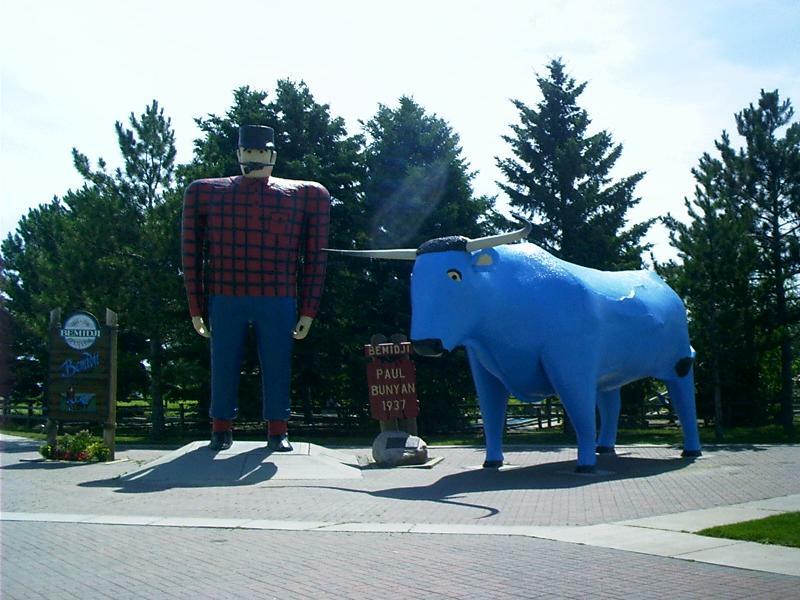 Erected in 1937, these statues commemorate the birthplace of the giant lumberjack and his big blue ox, but this is a bogus memorial. Everyone knows Bunyan was born in Presque Isle, ME, and walked from camp to camp through the Dakotas all the way to Walla Walla, WA, following the timber harvest. 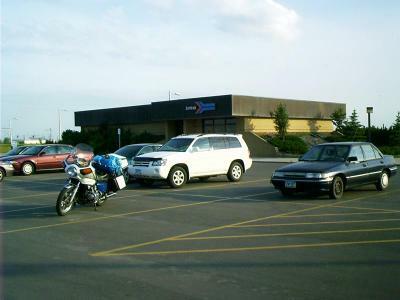 Today, he commutes (by motorcycle) between offices in Seattle, WA, and Anchorage, AK. It's a great place to stretch your legs and indulge your inner hunter/gatherer. Why include a picture of this perfunctorially functional modern depot? After all, how can it compare with the architectural monuments put up by the railroads in the past century? Well, using any depot at all is better than stopping and putting a step down at a grade crossing, which is what the railroad used to do in several regions and still does in a few, but my reason is this: To the west, US 2 adjoins the mainline of the Great Northern Railway -- now the route of Amtrak's Empire Builder passenger service, and this is where they come together. Anyway, I thought terrorists might be interested. Red sky at night; campers take fright. ... so it was late in the day when I dropped off the edge of the Canadian Shield into the park near Arvilla, ND. I was running on reserve and inquired seriously of the host and hostess as to sources of fuel. They told me there weren't any services nearby but in Larimore, ND, seven miles away, so, after putting up my tent, I poured my spare bottle into the tank and rode to supper. I snapped this picture on my way. 4-1/4 gal of gasoline filled the tank and also the spare. At the Red Dog Saloon, I consumed a pizza. It was truly dark when I returned to camp. Just after midnight or slightly before, the clouds you see on the horizon blew through, bringing with them gusty winds, a little rain, and an unbelievable electric display. I considered fleeing to the nearest building but decided I ought to stay on my back, lying low until the storm was over. Rhode, Chuck. "Over the Canadian Shield." The Hi-Line and the Yellowstone Trail: To Glacier Park and Back Again. 1 Sept. 2004. Lacus Veris. 24 Apr. 2019 <http://lacusveris.com/The Hi-Line and the Yellowstone Trail/The Bois Brule/The Canadian Shield.shtml>. Last modified 6 Oct. 2015. Served 54636 times between 16 May. 2010 and 24 Apr. 2019. Contact mailto:CRhode@LacusVeris.com?subject=LacusVeris.